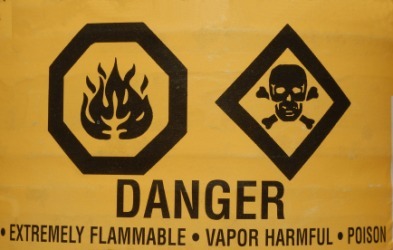 A sign warning of things that might be lethal. The definition of lethal is something very harmful or destructive, especially something that could cause death. A gun shot wound is an example of something that could be described as a lethal wound. "lethal." YourDictionary, n.d. Web. 24 April 2019. <https://www.yourdictionary.com/Lethal>. Causing or capable of causing death: a lethal weapon. See Synonyms at fatal. Extremely harmful; devastating: accusations lethal to the candidate's image. From Latin lÄ“tÄlis (“mortal, deadly"), improperly written lethalis, from letum (“death"), improperly written as lethum, as associated with Greek Î»Î®Î¸Î· (lethe, “forgetfulness"). (chemistry) One of the higher alcohols of the paraffine series obtained from spermaceti as a white crystalline solid. Abbreviation of “lauric acid ethereal salt", so called because it occurs in the ethereal salt of lauric acid.